The Minimalist Quadro Thermostatic Bar Valve (Bottom Outlet) with Sheer Rectangular Slide Rail Kit from Hudson Reed is part of our contemporary collection of bathroom products. The Hudson Reed Minimalist Chrome Sheer Slider Rail Kit, for total flexibility, complete the look of your bathroom with a Designer shower kit. All Sheer slide rail kits include sliding rail, shower hose and shower head. The Quadro exposed thermostatically controlled bar valve with bottom outlet, constructed from solid brass with a chrome finish. The handle on the left controls the water flow, whilst the handle on the right controls the temperature. Thermostatic showers prevent a fluctuation in temperature whilst the shower is running - prevents the risk of scalding, or sudden cold spells! 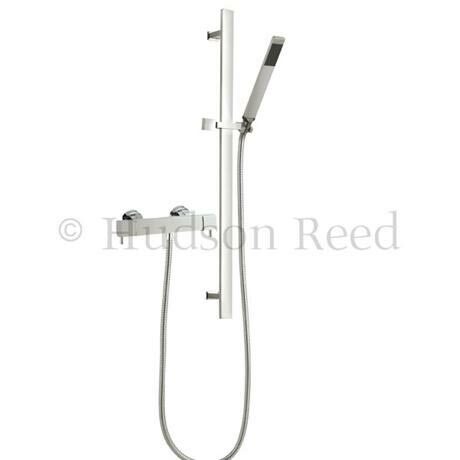 Give your bathroom a makeover with this Hudson Reed Quadro Thermostatic Bar Valve with Sheer Slide Rail Kit.